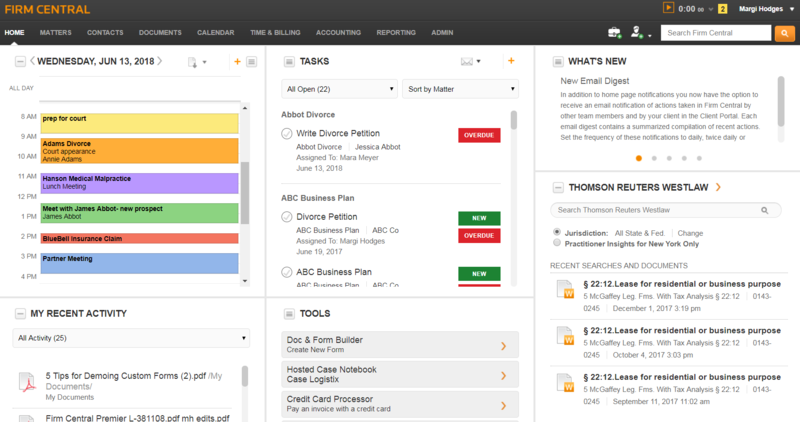 At launch in 2013, Firm Central was a solid user friendly, cloud-based matter management software. Fast forward through five years of gathering customer feedback and making product improvements, to present day, where the robust end-to-end software consists of customizable matter management, sophisticated time & billing, legal rules-based calendaring, enhanced reporting, and most recently, built-in accounting. This year, has been one of rapid-fired, customer-centric enhancements. One coming after the other, building upon the existing solid foundation to create an end-to-end, holistic platform for small firms to rely upon to run their successful business. Let’s run through a quick recap of Firm Central’s most noteworthy improvements of 2018. Another significant improvement was deeper integration with ClientPay for online credit card processing. Not only can your clients make credit card payments online, now you can include a clickable link or a QR code on your invoices to make it easier than ever for your clients to pay their bills. Once the bill is paid online, you receive notification and the payment is automatically applied to outstanding invoices. Customizable invoices give more control over the look and feel of your invoices. You can easily add account specific details, and an updated layout makes it easier for your clients to interpret the charges, which will encourage prompt payments. Trust & Retainer Account functions now support multiple accounts per matter, prepayment and escrow accounts, and fund transfers between a matter’s accounts. You can easily view account balances to see if an invoice can be immediately settled. Quick-View components provide more-effective client and matter management, including a new client billing feature that displays the client’s balance across matters. A new Matter Time & Expenses feature provides a single customizable view of all the time and expenses for a specific matter, regardless of who recorded them or when. Calendar enhancements provide more–efficient management of deadlines and appointments with views of deadlines entered using Deadline Assistant, customizable events, color coding and expanded agenda data ranges for at-a-glance views of events and upcoming deadlines for individual matters. An automated Email Digest provides improved client communication management due to timely notification when clients add documents and comments, or mark documents complete via the Client Portal. The digest also provides notification of your team member activity on matters, calendars, tasks and Deadline Assistant events. And last but certainly NOT least, small law firms can now manage both their matter and finances all in one place with Firm Central’s recent launch of powerful built-in accounting; eliminating the need to integrate with third party accounting software. This functionality allows you to manage accounts receivable, accounts payable, your chart of accounts, and check writing, along-side the existing trust accounting capabilities. You can generate detailed accounting reports, including balance sheet, bank reconciliation, trial balance, P&L, sales tax liability and account transactions. Easy reconciliation and internal controls reduce errors and help ensure compliance and audit readiness. And Firm Central’s built-in accounting functionality means no more need to enter data into or reconcile between disparate systems. Firm Central is a leading cloud-based practice management solution for solo and small law firms, providing desktop compatibility with Outlook and Windows 10 and access to a user’s essential practice functions in one convenient dashboard. Firm Central combines firm management tools, such as scheduling and time & billing, with practice resources, such as legal research, rules-based calendaring and automated document drafting, to provide the most comprehensive legal practice management software in the small law firm market. It also allows firms to easily store, organize and share information in one integrated, secure platform. Firm Central’s fully integrated legal time & billing feature enables users to enter and track time within the Firm Central dashboard. Built-in accounting features provide seamless accounting and bookkeeping tailored to fit your law firm needs.